Don’t be intimidated by desert hiking. Plenty of gentle trails provide an introduction to this exotic terrain for kids and adults of all abilities. Here are three of Scottsdale’s best easy trails to entice everyone outside. 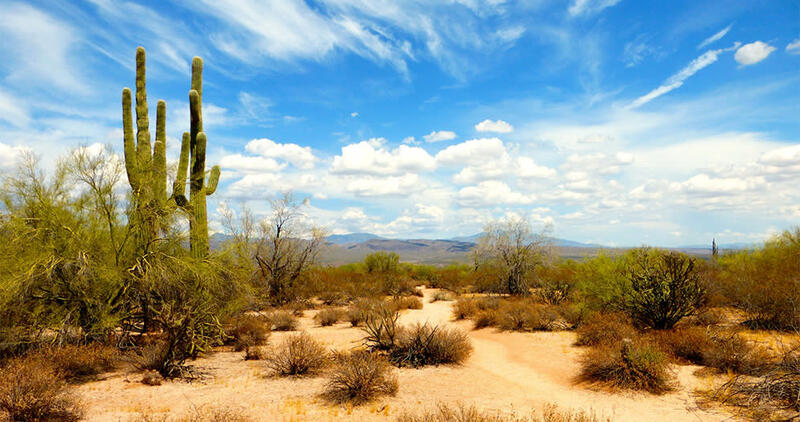 When it comes to exploring the vast McDowell Sonoran Preserve, the largest urban preserve in the United States, options can be overwhelming. Maybe this will help. At three major trailheads, visitors will find accessible interpretive trails, perfect for strollers, wheelchairs and those just wanting a picturesque stroll. At Lost Dog Wash Trailhead look for the Kovach Family Trail, at Gateway it’s the Bajada Trail, and Jane Rau Trail is a gem of Brown’s Ranch. Each is about a half-mile long, paved and lined with informational signage. Of the three trails, Jane Rau is my favorite. It circles through a lovely wash area, punctuated by tall saguaros and clumps of boulders. Named for the longtime Scottsdale conservationist who spearheaded the effort to save this swath of desert, this little lasso of a path provides a soothing getaway. Hiking here one warm summer morning I had the trail all to myself. I enjoyed views of Brown’s Mountain, a slanted hump rising from the desert floor, and the smooth precision of neighboring Cone Mountain. But the Jane Rau is less about big vistas and more about small details. I noticed the way sunlight splintered on the spines of teddy bear cholla, the soft landing of a butterfly on a yucca stalk and my best sighting, a single flower on the arm of a mighty saguaro cactus. It was long past flower season. Most saguaros had already produced and shed their fruit. But this lone flower paid no attention to calendars or schedules. Despite the scorching heat, it unfurled delicate petals and embraced the day, a champion for late bloomers everywhere. 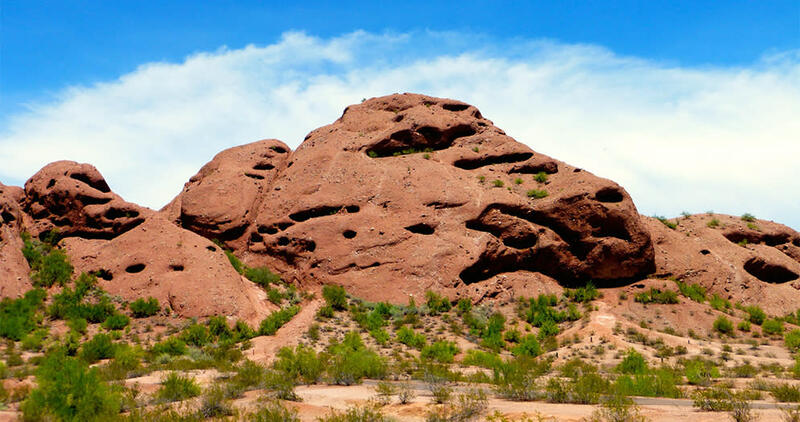 There are certain formations across Arizona immediately recognizable—the temples of Grand Canyon, the red rocks of Sedona and the crumpled buttes of Papago Park. Spread across 1,200 acres, Papago Park is filled with amenities like the Phoenix Zoo, Desert Botanical Gardens, baseball fields, a golf course and lagoons lined with palm trees. But it’s those misshapen sandstone knolls that catch my eye. For an up close look, I hike Double Butte Loop, a 2.3-mile meander that circles two of the distinctive formations. This is more route than pathway, following trail markers through open desert towards the rock hills. By the time I reach Eliot Ramada sitting at the base of the largest butte, I’m mesmerized. The stones are big and burly and slanted at odd angles. I feel like I’m watching slow-motion geological break dancing. Metal trail markers lead me to the base of the large formation and I circle it counter-clockwise. Eons of erosion gouged out the many holes, caves and alcoves in the rocky surface. On the backside of the butte, I pass by an impressive stone amphitheater where special events are held. I’m tempted to break into song to entertain a rapt audience of lizards but decide against it. Swinging back around to Eliot Ramada, the trail bears southwest, past the smaller butte and reaches the edge of the golf course before returning to the parking area. Flat, wide and easy, North Trail wanders through a lovely corner of desert. Best of all, numbered markers dot the path identifying plants and landmarks. By the time you finish the gentle loop, you’ll know much of the resident flora and how they survive and interact. Just grab a guide sheet at the visitor center before setting out and prepare to shake hands with the desert. Not literally, of course. Most everything out here will stab, jab or claw you. The desert isn’t cruel but neither does it abide carelessness. 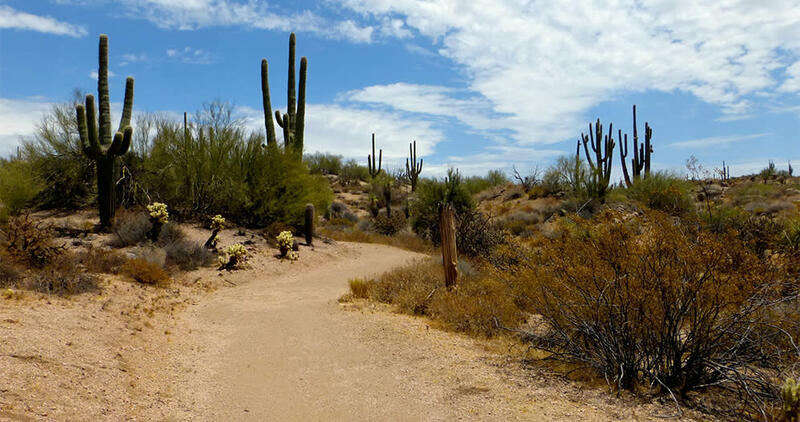 The 3.1-mile loop never turns challenging, although it does dip in and out of an occasional sandy wash. McDowell Mountain Regional Park encompasses over 21,000 acres of low desert plains and foothills so it’s no surprise the North Trail is a great spot for wildlife watching as well. Midway through my hike, I spot one of my favorite desert residents, a lanky jackrabbit. Jacks are actually hares and can streak across the desert at speeds of 40 mph, zigzagging around cactus, turning on a dime and leaving a nickel change. But on this hot afternoon, my jack just hopped off a couple of steps and gave me a look that said, ‘Pretend I’m invisible, dude.’ So I breezed on past. He reminded me of my old friend, wise-cracking Bugs Bunny. Man, I miss Saturday morning cartoons. Now if I happen to spot a coyote chasing a roadrunner, it will be the happiest hike of my life.